The Isle of Palms Resort offers a selection of split level Mediterranean style apartments situated in a securely gated tropical Island garden setting. The facilities at the Isle of Palms Resort have something for everyone. The ideal holiday Resort where you can relax in the tropical island surroundings. Enjoy a swim or spa, have a hit of tennis, play beach volleyball, try your hand at fishing from the calm Pine Lake at your door step; or simply laze away the hours and forget the hassles of everyday life. 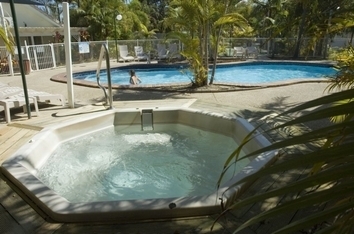 Facilities include: Two Swimming pools, Beach Volley Ball, Two Spas, Two full size Tennis Courts, Night Tennis Available, Resort games Room, Jogging Track, Direct Dial Telephones, Children's Wading pool, Licensed Restaurant & Bar, 3 Coin Operated Barbeques, Secure Undercover Parking, , Full Tour Desk service, and Conference/Meeting room.